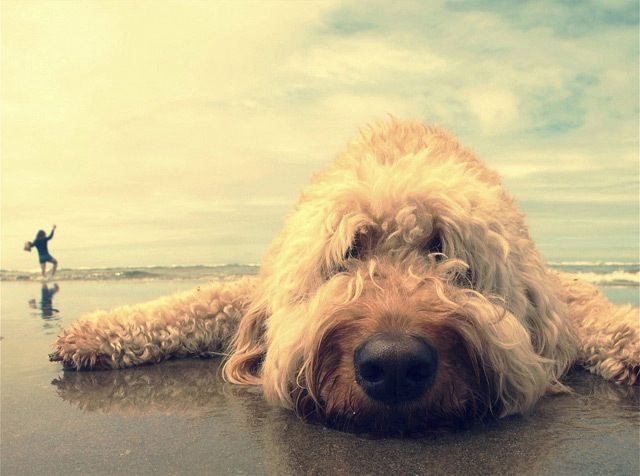 Sweet labradoodle lounging on the beach...I want to be her! * Having my dad back home makes very reminiscent for when my whole family was living at home. * I married a wonderful man. We have so much fun together, and we can talk through pretty much anything. He's my best friend. So thankful! * Yoga helps me feel revived. It's my favorite form of exercise besides running. Sometimes I like it more than running though. * I discovered I'm a little allergic to down pillows. I hate how the feathers smell and how hard they feel under my head. I get instant headaches from them. Yuck. I'm in love with my memory foam pillow. * I've been listening to Mumford & Sons. They're my new favorite besides The Lumineers. * Sometimes, I feel like there is so much build up to Christmas it makes me nervous. Does anyone else feel that way? All my presents I'm giving away are wrapped except my dad's. What do you buy for your dad who has EVERYTHING?? I might do something with the photos I have from our wedding. * Peppermint tea is delicious! I feel healthy when I drink it. * Bill and I finally found a cookie that we both love. This could be dangerous, but it is a miracle. We never have the same taste in cookies! The one we both agree on is Spritz cookies. * Sometimes, I like to feel like I'm still as awesome when I was in college and could stay up late and go to classes and workout the next day, but I'm not like that anymore. Yawn... Night everyone!